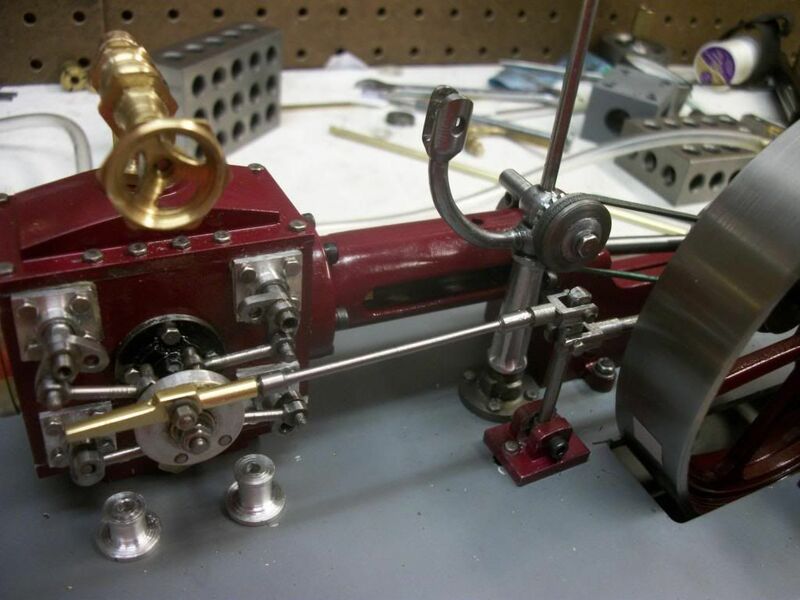 This is a modification that I made to my Corliss engine to improve the valve adjustment. I am posting it here instead of on the engine build thread because it could be used on other engines and other applications. The wrist plate must be adjusted so that it oscillates an equal amount on either side of vertical so that the two steam valves that it operates can be adjusted for equal function. There are many factors that effect this but after the engine is assembled there must be some way to make fine final adjustment to the linkage to fine tune it. The last part of the linkage is the rod between the wrist plate and the rocking lever. A link like that is often made with right and left hand threads so that rotating the rod changes its effective length. Some of you might do left hand threads at very small scale but I'm not up to that. 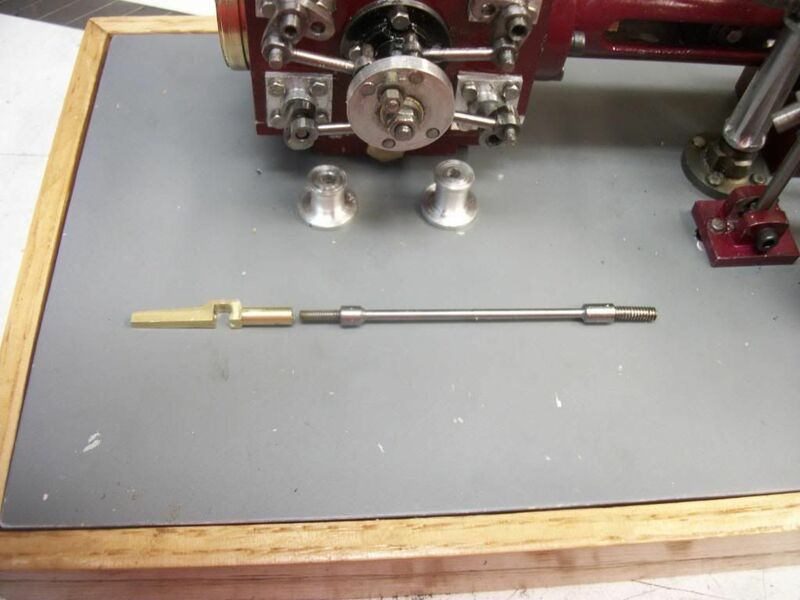 The first rod that I made had right hand #4-40 threads at both ends and could be adjusted only by one full rotation of the steam hook or 1/40" increments. I wanted finer adjustment and was going to change the rod ends to #2-56 thread when it occurred to me that if I change the thread at one end only, I would have a differential screw that would give infinite adjustment at the rate of 1/40" - 1/56" per full rotation of the rod and the rod could be rotated any fraction of a rotation. It also seems that this could be used to adjust the valve on a slide valve engine without the need to open the steam chest. As soon as I read this, I remember making a scribing block which used this principle for the fine adjustment of the scriber point, (one of Harold Halls designs). Is it less likely to rotate with different threads or is the rod unlikely to rotate on it's own (for some reason) anyway? I only ask because most screw adjusters I've made had a lock nut. Differential screw threads are certainly not an original concept. I can't remember where I first saw it used but it probably on some kind of tooling where fine adjustment is common. The truth is that I really stumbled on it here almost by accident. I knew that I would have to remake the brass hook for the smaller thread but I just didn't want to also remake the fork end at the rocking lever. AHA! Laziness as a positive attribute! The threads are pretty tight and I might get away with it for awhile but a lock nut should be fitted. I should also file flats on the shoulder of the rod. Thanks for that Jerry. Forgot to add it's a clever idea! Can you tell me though, if I had say a .5mm pitch thread on one end and a 1mm on the other would I get .75mm movement per revolution? I have to ask these things as I'm nowhere near as clever as some of you guys! Note that Jerry is using 40 tpi on one end and 56 tpi on the other. In his case, when one complete revolution is made, one end will move 1/40" in one direction while the other moves 1/56" in the other - since both threads are right handed. That gives him the difference in movement. If one thread was right handed while the other was left handed he would get the sum of 1/40" and 1/56". In the example you cite, one end will move 1 mm while the other moves .5 mm in the opposite direction. What it will do is allow a .5 mm extension or contraction per turn. To get the same movement with a right hand thread on one end and a left hand thread on the other, you would make both ends with a .25 mm threading. Simply stated, if both threads are right or both are left you will get the difference in pitch movement while if they are opposing you will get the sum. In practice, you want to pick thread pitches that are close to each other that don't share a small divisor. The idea is to get a very small movement without having to cut an extremely small pitch thread. For instance, you could cut one thread at 1 mm and the other at .8 mm and get a movement per turn of .2 mm. Or you could use .35 mm and .40 mm to get .05 mm per turn.